Here is a Before & After of the Mauldin High School scoreboard renovation that Vision took on. What a difference it makes, Go Mavericks! Just another one of the exciting new things we can do with our ZUND G3 – Stencils! These were cut out of .060 polyethylene. We can make custom stencils, or we have stock files that we can cut for you, any size up to 4′ x 8′. Our signs and banners make the course look good! ponsor banners in action on the course and stage. We are looking forward to working with new sponsors in the Chattanooga area. 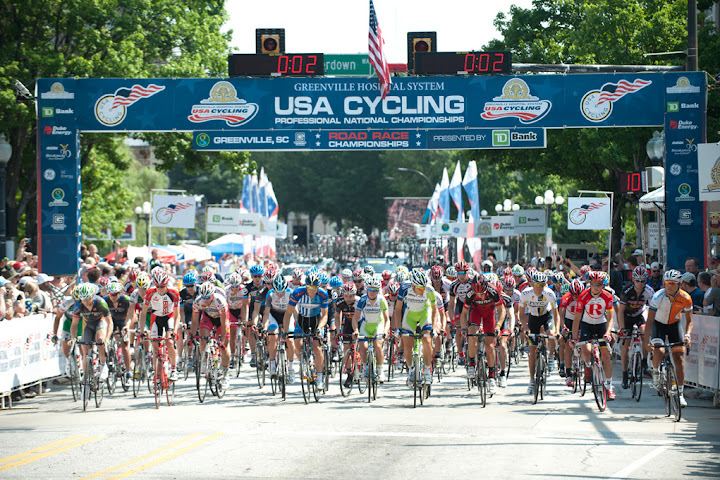 The cyclists of the US PRO Cycling Championship 2011 are lined up in downtown Greenville, SC ready to begin their race under the start truss that we printed! That Vision Screenprinting produces architectural graphics and fine art reproductions. These photos are for a current project and include screenprinted glass etching, vinyl graphics and framed canvas prints. Please contact us if we can assist you with a current project. Great news, we are almost moved into our new location on 210 Old Piedmont Hwy, Greenville, SC 29605. We will be completely moved on Dec 1. We have been working hard to keep production going without any delays from the moving process. Please be aware our phones will be down on Wednesday Nov 30. You can check the progress of our move and see more pictures on our facebook page. The screen printing department at our new location. Print runs that are time-consuming for you can be outsourced to us! Welcome to our new website! We are excited about the new look and feel and all the possibilities of communication that have opened up from our new venture. Feel free to browse around and let us know what you think. If you would like us to send you a quote please click the “request an estimate” button at the top.